“What’s the point of teaching your kids a foreign language if they will never become fluent?”… “There’s no point in kids learning a language if they don’t need to use it.” These are the types of comments I have heard from parents who think that It’s a waste of time to teach their child a language, unless they will need, or they will be able to speak it fluently. Since recently deciding to introduce Chinese Mandarin to my children, I have been thinking about this a lot. It hasn’t even crossed my mind that having my children learn another foreign language would be a waste of time, even if they don’t, or will never speak it proficiently. My children who are almost three and five are bilingual. We live in Italy and they speak English and Italian to a native level for their ages. We follow the OPOL approach. My husband speaks with them in Italian, and I speak with them in English. They have been learning Spanish for the past year and a half spending a few afternoons a week with a native Spanish speaker. Neither my husband nor I speak Spanish very well. My eldest can hold a good conversation though, while my little one understands a lot and can speak the basics. We also have fun learning bits and pieces from other languages. Before having children, I lived in numerous other countries and learned the basics of a few different languages. Sometimes I teach my kids a few words here and there for fun. We have only just introduced Mandarin, and hope that the language will spark interest in my children on a more serious note. Neither my husband nor I speak Mandarin, but would like to learn along with our kids. Why you ask? Well, for many reasons. 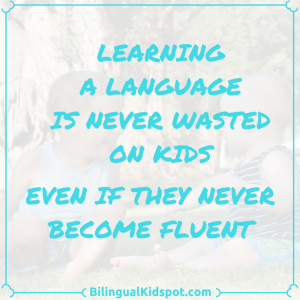 There are so many benefits of kids learning languages, other than knowing how to speak them fluently. We love learning about the world. When we are looking at our world globe together, my son will often point to a country and ask me what language they speak there. He is curious about different parts of the world and excited to travel everywhere one day. (I wonder where he got that from). When we are looking through our Atlas, talking about other countries, we speak not only about the people who live there and the language they speak, but also the different foods they eat and music they play as well. My boys love listening and dancing to Spanish music, and learning about the Great Wall of China. They love to play with their Eiffel Tower from Paris and their Statue of Liberty from America, “where they say faaaast” in an American accent, as my kids like to point out. Languages help children develop an appreciation for the world around them, and cultures other than their own. It helps them to realise that there is more out there than what we know here. 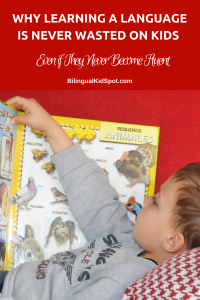 Knowing other languages can help your child be more adaptable in different environments. When my kids hear people speaking different languages it doesn’t affect them in a negative way. It isn’t something different and new. Instead, they embrace the change and usually want to learn a few words of the new lingo. At the park recently my son met a little girl from Malawi and they started to play in Italian. He then heard her speak to her father in her native language. Immediately he was curious to know what language she was speaking. He didn’t laugh or get embarrassed as some other children did. He wasn’t scared that he couldn’t understand. Rather, he wanted to know what language it was and what they were saying. I will never forget when we were out at the park one day and a little boy heard me speaking in English with my boys. He ran over and immediately said “Hello how are you?” in a strong French accent. I was surprised actually as not many people speak English where we live, and after talking with him, I found out that his family were on holiday. My kids started talking back to him in English and the little boy was really excited. His English wasn’t great, but he could communicate the basics and was having fun trying. In no time, he and my boys were running around playing like they were best friends. I could see the excitement in his eyes that he could speak to someone who understood him, even if it wasn’t in his native language. I used to carry around a phrase book when travelling. You can get those multi-language books that have the basics of a few languages in one. It made it easier when ordering food in a new country or buying train tickets. It was fun to learn too. You don’t need to be fluent in a language to travel, but it is nice to know a few words to get by. To immerse yourself in the culture and to be able to understand what is going on around you makes the experience so much better. Why not teach a few new words if you are planning to travel with kids, or even when learning about a new country together. You never know, it may just make them want to visit one day. My son has asked numerous times to visit the great wall of China, and I would love to visit as a family one day. Perhaps by then we will know enough of the language to get around. Learning something new is never wasted, no matter what it is. 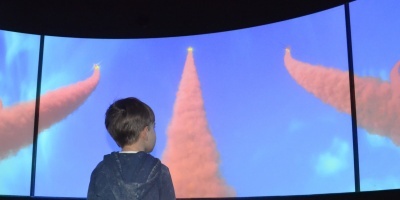 Kids are naturally intrigued by new things and love to learn. Learning new languages helps children to stay open minded to learn other things as well. It shows them not be afraid of the unknown, and to try something at least once even they don’t know what it will be like. I don’t expect my kids to grow up speaking every language fluently. We are doing our best to at least make sure they become proficient in their native languages, English and Italian. It doesn’t worry me at all if they are not perfect Spanish speakers when they grow up, or if they only ever learn the basics of Mandarin. But, I hope that they grow up well rounded, open minded individuals, who like and want to learn new things. I hope that they will be able to appreciate different people, their languages, and their culture. I hope that they will travel to parts of the world and be able to embrace the culture they are immersed in. And, just maybe when they are older, and they meet someone who doesn’t speak their native language and they are able to communicate with them even just a little, that they will see that learning languages was never wasted. 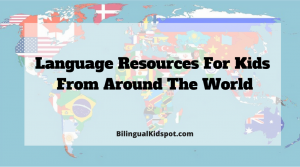 Teach your child a language with these resources! Great article! We at Nanos Spanish witness the children’s joy and efficiency in learning Spanish every day! I love it when their pronunciation is perfect and when it’s not! 😆 the cutest thing! This is one of my favorite articles, Chontelle! Completely agree with every point. I’m not fluent in my second language, and I’m not sure my kids will ever be. But the effort is completely worth it. Thank you so much for this much needed article. I am working so hard to teach my kids Mandarin Chinese, even though I am not fluent, and I am not sure that they will ever be. It’s worth to encourage them to embrace not only their heritage but also all languages and cultures. You sound very motivated and your children are very lucky. I knew before that kids should be taught a new language. However when I came over this blog I have understood that there are many benefits that a kid can experience by learning a new language. I agree with Amanda. 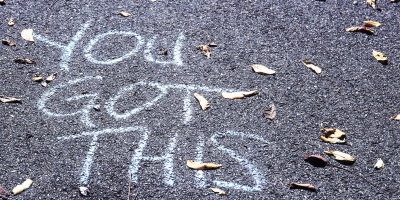 I really love this blog, and now I shall share it with my friends as well. I’m pregnant with our first child and I’m not sure yet if I should speak in English or German with the child. Me and my husband are Germans and we live in Germany but I’m an English teacher and I consider myself pretty fluent in English. Some times I think English is more my mother tongue than German. I used to study in LA (only for a short time) and my heart and mind is thill there. Speaking, reading and even thinking in English comes natural to me. But still, I’m no native speaker and I’m making mistakes for sure. So I’m not sure what to do because my friends/family tells me not to talk in English with my kids. I’d be crazy to do so because I would teach them grammar mistakes as well….. If you feel comfortable speaking English then there is no reason you can’t speak in English to your child. Using the OPOL approach, with you speaking English and your husband speaking German, you can bring your child up bilingually from the start. There are many other parents out there who speak their non-native language to their children and they do just fine. If you teach English I am sure your grammar will be just fine. Later on, if you think it is needed you can also introduce outside resources. Betty! I am scared in the same way – I’m a native English speaker but with no experience teaching. 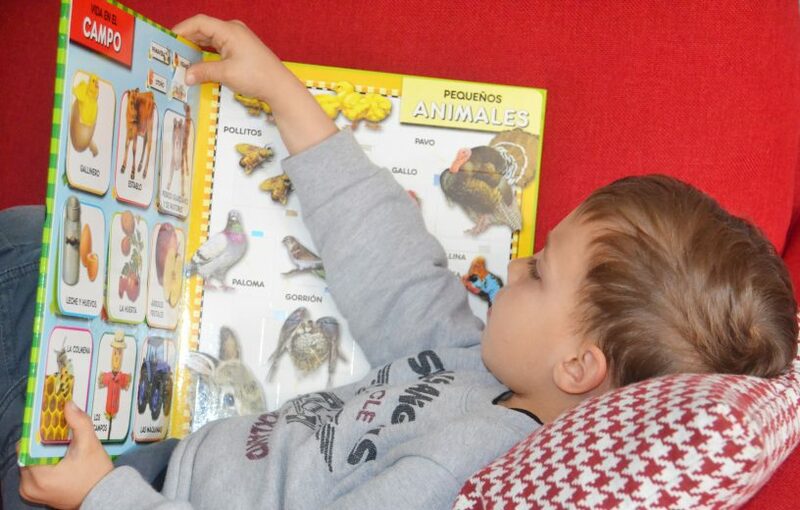 I’m determined to raise our future kids learning Spanish and English with the OPOL approach. 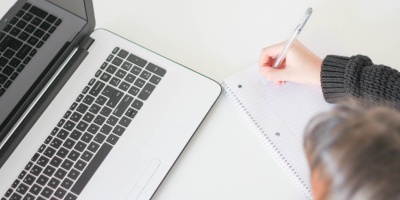 I need blogs like these to support my approach and decision to raise kids our way as I’m sure I’ll experience negative feedback along the way. Great article and comments! Bravo!!! This peice is spot on! As a bilingual teacher and owner of My Escuelita: Spanish for Kids I get to witness these very points each day. This is an amazing resource to share with families! Gracias!!! There are 2 main reasons for me, firstly that kids pick up languages better. I learnt French at 3, and my accent is great. My vocabulary has gone, but I know I could pick it up again if I wanted to. By comparison, learning Mandarin as a 17 year old was so tough! Secondly, learning a second language improves the first language. I loved seeing words from other languages in English, and understood grammar better. Thank you Amanda. Yes that is true and I see it with my own children. They have picked up Spanish so well, whereas I am still to perfect my Italian! My daughter’s English is good, and I am not an English native speaker. But the most important thing is that she is familiar with both languages and she is not scared of speaking a different language. She can choose. Gracias!